Madaari is not a film that will stay with you as you, in your day to day routine, succumb to the pressure and become part of the corruption that ails our system, feels Savera R Someshwar. Do we laud cinema because it seeks to be sensible? Do we commend a film because it takes, head on, an issue that is destroying the very essence of our nationhood? Do we hail a film because it tackles a subject we all need to open our eyes to, that we all need to take responsibility for, that we all need – in our individual capacities – to do something about? Do we praise a film because it takes stylistic chances in an attempt to engage our attention? Do we applaud a film because it has an actor who is, in general, fantastic and makes us resonate with the characters he plays? Or -- bottomline -- do we fall in love with a film because it manages, somewhere, to touch something within us? To evoke a reaction that we can’t ignore? Those of you who have watched the Madaari trailer – and probably waited for the film – would have a fair guess at the plot. A father loses his son. And decides the system, and those who feed on the corruption to fatten their already burgeoning pockets, will have to pay. In order to do so, he kidnaps the son of a powerful politician. And then, the film attempts to take a particular direction. 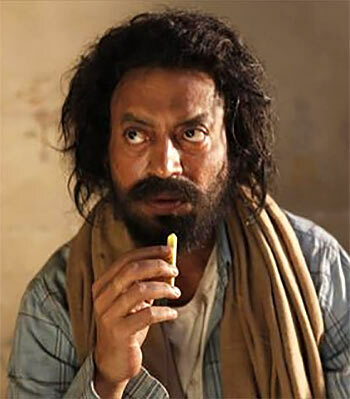 It has a lead actor, Irrfan Khan, whose name is testimony to his talent. It has a script that made Irrfan pick up the phone in search of a director. It has a director, Nishikant Kamat, whose potential is interesting. It has moments, excellent moments, that strike a chord with you -- that make you smile, that make you sympathise. In particular, Irrfan with his son. There are some really, really nice moments between Irrfan and Vishesh Bansal, who plays the lad who is kidnapped, the politician’s son. Irrfan at the hospital, tortured by memories you don’t see, as he waits for Bansal to recover from food poisoning. But these moments are few and far between. They are not adequate to make you feel the rage the film intends. Madaari does not make you cringe. It does not make you angry. It does make you, at least for the few hours that you are in the theatre, want to stand up and do something about the system. It is not a film that will stay with you as you, in your day to day routine, succumb to the pressure and become part of the corruption that ails our system. At the end of the day, it does not even make you applaud the protagonist or his journey. It was a film that needed defter handling. It needed to be a film that was not overwhelmed by the fact that it was an Irrfan Khan starrer. Because a film like Madaari is a film that needs to be made. We need movies that will hold up a mirror to us and force us to look at the kind of society we are content to live in today. We need movies that will stop us from being frogs in a slowly boiling pot of water, absorbing the gently rising heat, not realising that, soon, it will kill us. We need movies that will awaken us, or shame us, so that we consciously refuse to succumb to a corrupt system. We need movies that will motivate us to teach our children the value of doing things the right way. Unfortunately, the well-intentioned Madaari fails to make it to that space in our hearts.